Tennis courts should be resurfaced every 4 to 8 years. This is a standard range with quite a few variables, as you could imagine. Lets go over some reasons why the same resurfacing process would last 4 years on one court and 8, or double the amount of time, on another. Improper slope = ponding water and premature breakdown of acrylic surfacing system. Insufficient compaction = susceptible to deforming, moisture damage, cracking, etc. Incorrect or missing drainage system = backup of water and a long list of problems like surface bubbles/blisters, premature surface wear, and more. Surface debris removal – Don’t let leaves, pine needles, or any other organic debris build up on the court surface. It will hold moisture and rot on the surface. This is cause faster wear of the tennis court surfaces. Trim edges – Be sure to keep grass, vegetation, and dirt trimmed down around the court edges. This will help to prevent back-up of water that drains off of the court. Puddled water will break down the acrylic surface coatings prematurely, and result the need for more frequent resurfacing. Periodic washing – Light to moderate pressure washing of the surface with mild detergents will help to extend the surface life and keep the court surface looking good. 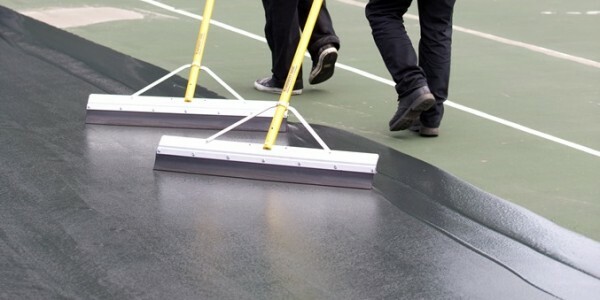 Many court owners want to skip the Acrylic Resurfacer step and just apply the color coatings. Acrylic Resurfacer re-textures an old smooth court and helps to ensure the proper application rate of color coatings. 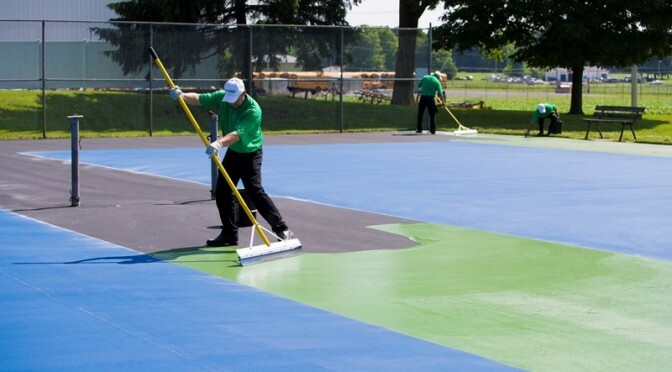 Since tennis court coatings are applied with a soft rubber squeegee, the colored surface coatings tend to “wipe off” when the surface is old, smooth and polished. This results in thinner surface layers that won’t last as long, and definitely impacts how often the tennis court should be resurfaced. Obviously, if there is good tennis programming and lots of players, it can impact the wear of the tennis court surfaces. Active players and high traffic counts will speed up wear of the surfaces. If this is known before resurfacing, talk to a SportMaster representative and they can offer recommendations or prepare a custom scope tailored to your facility. Extra coats may be recommended to extend the life of your tennis court surfaces. Click on the “Contact Us” button and we can put you in touch with a factory-authorized tennis court contractor. 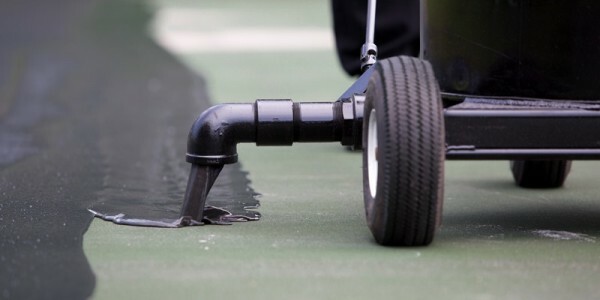 They can provide free estimates and make sure your tennis court is resurfaced properly. SportMaster Sport Surfaces are stocked and supported world-wide, and are ideal for all climates from extreme heat to frigid cold. Previous PostCan Pickleball Be Played On A Tennis Court?Next PostHow Do You Paint A Tennis Court?